We were seven strong counting me. For the second time we welcomed David, one of Casey's beginning students. He knows the Big Three plus Cumberland Gap and I Saw the Light. When we would play one of David's songs, I would have all the banjos play the lead together, very slowly, so that David could ease his way into group playing. Strength in numbers, you know! Then, I'd ask David if he was willing to play solo and kick the song off. He's an extremely good sport so he always said yes. Then we would go around the circle and everyone would play. Scott, Jon, and I were all playing banjo. This, of course, gave David a chance to hear other people playing the song and his comments were interesting. After we finished playing Boil Them Cabbage he said, "Mine doesn't sound the same as yours. It didn't even sound like we were playing the same song." Of course I thought his playing sounded fine but I knew what he was talking about. It was that inflection thing again. So I explained to him that he was playing it exactly as Casey and I want our beginners to play: with no inflection. Which is to say, with no bounce. And I demonstrated for him how he was playing it--I took out all my inflection and all my bounce and played Boil Them Cabbage completely straight, with every note even. It still sounds like Boil Them Cabbage, it just doesn't have any personality! But if you try to put the personality in too early, you usually end up with a mish-mash of terrible timing. In the early stages of banjo playing, you simply don't have the tools to play it any other way--even if you think you do! But, now that David has done the grunt work and has played it "straight," now that he has that "straight" version in his head and in his hands, he can actually HEAR the difference in what he is playing and what I am playing. And now, as he put it, "I can hear what the song is supposed to sound like." And remember, we are playing these songs very, very slowly. Slow jam speed. So, now, and only now, he can try to emulate what he is hearing and begin to put some bounce in his playing. I told David and the group that I had had a similar experience when I was first learning banjo. I was in college at the University of Georgia. I was trying to learn Cumberland Gap from the Earl Scruggs Book. I'm not sure why I picked that song, I certainly had never heard it before. Looking at my battered Scruggs book now, I think I picked it because it was all on one page and it LOOKED EASY! Most of the rolls were "open" (no fretting) and when I did have to fret it was mostly second frets--not complicated! But I had no clue as to how it was supposed to sound. 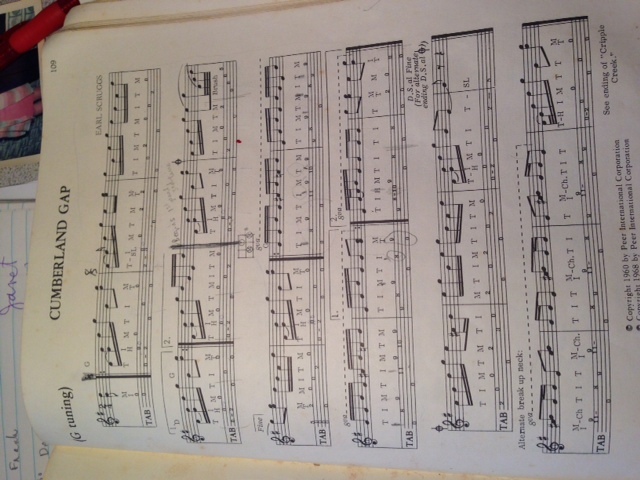 I finally worked my way through the tune, low and high, but still it was labored and clunky. Finally--and I'm not sure why I thought of this--I put on the Foggy Mountain Banjo album (vinyl LP) and listened to Earl play it. And even though it was fast as hell, because I had done my homework and labored long and hard over the tune, I was able to pick up the "feel" of the tune. I can see now in my book where I marked, in pencil, some of the "accents" I heard Earl making in the up-the-neck part. And on hearing Earl play it, the tune came to life for me. I still couldn't play it fast but I had the bounce. So this theme of "bounce" and "inflection" seems to be coming up a lot lately. I think that's a good thing. It means the students are listening closely to what they are playing, and listening closely to what the other students are playing. And this is a huge part of learning to play the banjo. And a huge part of why jamming is so important! Hang in there, David! David, welcome and I hope you read this blog and keep coming to the jam. They help your playing tremendously. I completely understand what you are saying, I frequently have the same issue and it takes playing a song a zillion times to finally start getting the bounce. I remember specifically that “Boil Them Cabbage” and “Cripple Creek” just didn’t sound right. More recently, my “John Hardy” just did not sound like what the others were playing. If you read the blog from a couple of weeks ago called “Bouncy Bouncy” you will see that I had the same issue. Hang in there. If this ol gal can do it I know that you can. Hope to meet you at Tuesday’s jam next week! I enjoy this blog very much. I am much much OLDER than you younguns, but I love the Banjo and decided at 73 years old to try to learn..Any suggestions will be appreciated. I’m using the Murphy Method and she is very well understood. She takes her time and this helps a student like me. Jane! Awesome! I have friends who can’t believe I too up the banjo at age 58. You need to come to a jam. I would love to meet you!